The always energetic Sergio Brown offered this tweet earlier in the week. Sunday he backed that up with a trio of tackles, a sack, a pass deflection and was a stabilizing force at the backend of the Colts defense. “I saw (Brown) fly around and make a bunch of plays, make a great third down stop in the first half,” Chuck Pagano said of Brown after the game. 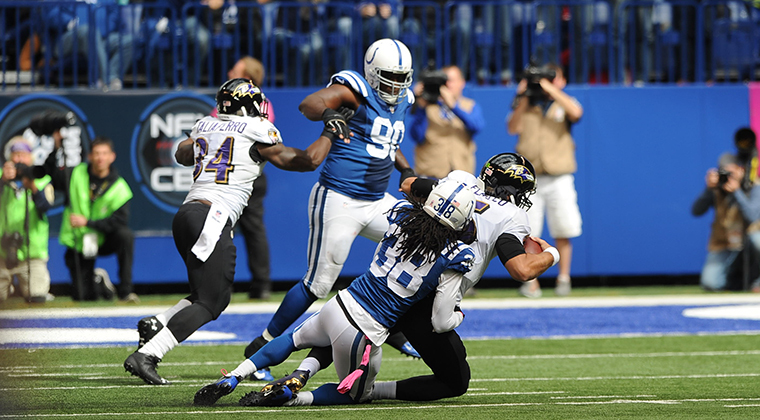 The highlight for Brown came on an early fourth-and-one at the Colts three-yard line. With Baltimore going for it, Brown came flying in from Joe Flacco’s blindside and sacked the Ravens quarterback. As Brown was wrapping up his media sessions on Sunday afternoon, his head coach walked by him and let out a, “Way to go Serg!” which brought an ear-to-ear grin across the face of the Colts safety. It’s a moment Brown’s wanted for a while now and he made the most of it on Sunday. “I couldn’t write a story better than this,” Brown said.